I’m a bit late on this, at least compared to some other blogging folks, but I wanted to post a quick reflection on last weekend’s Homebrew Con (formerly known as NHC, and I resisted using the new name for as long as I could). 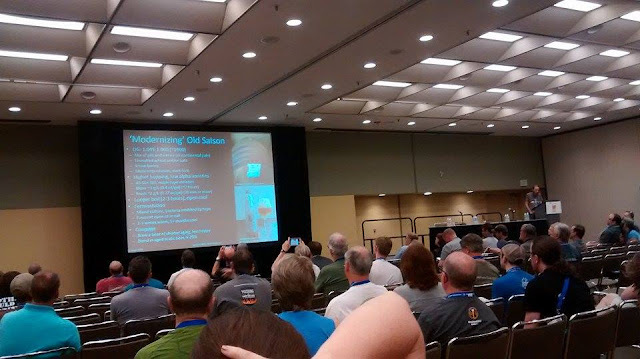 This was my second homebrewers conference, I went last year in San Diego, and it was a great time. I got more out of this conference than last year’s, probably for a few reasons. Having already been once, I already knew some brewers from around the US who would be going this time. In addition, I was presenting a seminar so I had a bit more active role in the conference than before. And the readership of the blog has grown so there were more folks who follow this that I hadn’t met before. And finally, I went without knowing anyone local to me who was also going, which meant I had to make more of an effort to meet others. Speaking – I was pretty excited to have an opportunity to give a talk this year (thanks to the organizers for the opportunity and to all who helped me gather info, especially Thierry!). I expect I wouldn’t have gone to the conference if I wasn’t speaking. But I’m glad I went. 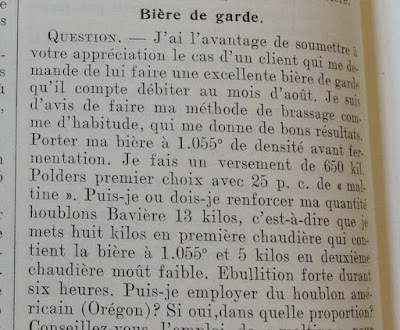 Anyway, the topic, grisette and saison history (focusing mostly on grisette) was a great way to put to use all the historical research I was doing in Europe for the past 9 months when I couldn’t brew. So having that outlet was great. And I think I did a pretty good job of outlining where grisette would have fallen with the info I have now as well as how it compared to saison, and how both might compare to modern examples. Speaking at the conference (thanks to Justin for this picture). The time slot was tough - 9 am after club night, so the biggest night of ‘organoleptic analysis’ (drinking) of the conference. But the turnout was good. I wish I had taken a picture of the audience but I was focused too much on trying to sound coherent and awake that I forgot until after it was over. But there were a few hundred people there to hear the talk, including some big names in the beer world (I wish I had a chance to ask what they thought of it). The talk was well received by everyone I talked to at least. And for the rest of the day (it was the last day of the conference) I’d get stopped regularly by people who had been there and liked it. So that was pretty cool. It was like getting a little hint of being a ‘homebrewing celebrity’ (more on this below). If you missed it and are an AHA member, audio recordings and videos of talks will be available here in the near future. I’m already toying with possible ideas to propose for next year. I have some stuff I’d be interested in doing, but I’ll have to wait and see if I think I can go to the conference. Brülosophers: Speaking of homebrew celebrities, I spent much of the weekend hanging out with Malcolm and Marshall from Brülosophy. To put it briefly, I think they are making some fundamental and important changes to homebrewing. Many aspects of brewing are driven by folklore, dogma, tradition. And that can be fine if that’s how you want to brew. Every homebrewer should brew the way they want to. But I think it is important to know what factors matter more and which ones don’t matter so much in recipes and process. These guys are getting that info out there. And it is making some serious changes. For much of my time brewing, doing a 90 minute boil for pils malt was given as a requirement. And fermentation temps, especially for lagers, were said to be extremely important. They have generated data to argue against this and, especially in the former case, to make a very compelling case. So by their ‘exbeeriments’ (awful beer pun, xBMTs from here on out) and getting this info out there I think they are doing the whole hobby a great service. They are quick to recognize limitations and not overstate their results, which I really appreciate. Their sample sizes aren’t huge (it is hard to do these sorts of tests) and the results apply to the specific trial where the data come from. In another scenario the results could be different. So they don’t draw sweeping conclusions, they present the trial and the data and leave that info for the rest of us brewers to take in and make changes to our process (or not) as we see fit. Like anything in science, one data point doesn’t set a rule, but it does say more than superstition. And there are some xBMTs that they’ve repeated a few times, sometimes with the same conclusion and sometimes with differing ones. And a series of data sets drawing the same conclusion tell quite a bit, especially when the only counterargument is dogma. One thing that stood out to me from their talk is that they said while some trials like fermentation temp, boil length, or grain selection don’t always result in differences in the beers, all the water chemistry trials have led to a noticeable difference in blind tasting. And that I think is a pretty significant finding. During the conference I had the opportunity to take part in one of the xBMTs for the first time. The beers were brewed by Ed of Ales of the Riverwards and the test hasn’t been disclosed yet, so I’m not sure what it was. But the beers were hoppy pale beers. And I can say it was really hard to tell the difference. In the end I came up with which beer I thought was different(at this point I honestly don’t remember what I chose as the different cup, either green or blue). The difference was very subtle and I perceived it as a harshness/level of bitterness difference, with one cup being smoother and the other two rougher. I accept that I could be totally wrong, both on which cup was different and what the difference was in the first place. I guess we’ll see. The best I can say is that in the end I picked a difference and I believed in it. Maybe I could do it if I had two back by back pints I'd notice it, but if I had one beer one day and the other the next day I wouldn’t note any difference at all. MTF Meetup – One of the best parts of the conference to me was the second annual Milk the Funk NHC meetup. This was organized following a great seminar by Jeff Mello (Bootleg Biology) on local and wild yeast (quick aside - Jeff advocated for a new definition of 'wild' for yeast that I am fully in support of!). These beers at the MTF meetup were some of the best I had, commercial or homebrew, while in Baltimore! I brought three beers, the youngest being about 1.5 years old, and I was happy to see more people with aged beers as well. Not that there is anything inherently wrong with quick sours, but I’m drawn to sour beer for the fermentation complexity more than the sourness. And longer aging helps get that more. Plus people bringing aged beers means they must have been doing this for a while. The turnout at the meetup was great and, although it may have been a bit disorganized, it presented a great opportunity to meet other MTFers and talk with some of the well-known mixed fermentation brewers. I had great beers from folks like The Mad Fermentationist Michael Tonsmeire, Ed Coffee at Ales ofthe Riverwards, Brian Hall from Brouwerij-Chugach, Matt Miller and the folks from Sour Beer Blog, Malcolm from Brülosophy and others I met at the conference (way too many to name, but quick shout outs to Tim, Justin, and Dan - though I may have only had Dan's beer at Club Night). Other highlights from the meetup were Michael Tonsmeire asking, jokingly, if I only brewed for one year about three years ago because of how old all my beers were. And Brian Hall giving away his secret (again jokingly) that he intended to become 'IPA famous' at the meeting by passing around a very nice IPA after we had been drinking sour beer for an hour. The hops really jumped out in that after so many not so hoppy beers, so I think his plan worked. I left the meetup wishing it would keep going, or happen again the following day, so I could talk about mixed fermentation with such an enthusiastic group of people some more. Rest assured that the MTF admins and those of us on the Wiki editing side are talking about ways to maximize the MTF discussion/sharing at next year’s conference. A quick aside as it relates to Milk the Funk, MTF received repeated mentions and praise throughout the conference, and I saw a good number of people walking around with MTF shirts. It was great to see how many people are in this community. Also in the world of funky beers, it was interesting to see how many talks there were on mixed fermentation/sour and/or funky beer/alternative fermentation this year. There were way more than I remember from last year. In line with this, it seemed like there were fewer talks on hops/IPAs this year. It is interesting to see these changes in the conference seminar list and craft beer in general. There were too many good talks for me to make them all so I’m looking forward to catching up when the seminars are posted. Being interviewed by James at Basic Brewing Radio (photo: Franklin). Meeting Other Brewers: I’ve mentioned before that one of my favorite parts about keeping this blog is that it connects me with others brewers with shared interests. Well Homebrew Con was like a magnified version of that. Especially when I got to meet with others whom I’ve already connected with through the blog, with giving a talk, and having been last year. But there were still plenty of people whom I was meeting for the first time as well. And spending a weekend regularly running into these people again is great. Among the folks I met at Homebrew Con, I really enjoyed meeting an active group of Canadian homebrewers. Western Canada wasn’t represented very thoroughly (I think I was the only one from BC) but there was a good group of Ontarians (Ontarioans?) like Eric from Eric Brews. The group I met were quite interested and active in promoting Canadian homebrewing and building active clubs, and possibly promoting more of a national connection for Canadian homebrewers. Homebrew Celebrities: I use this term as a bit of a joke because being famous/a celebrity in the homebrew world generally means a group of beer loving people who are disproportionately large, flatulent, and dudes, and who traveled across the country to hang out with similar people, think you (also often one of the same) are awesome. I mean to say nothing bad about anyone that falls into that category (and I fit most of that description). And also it was great to see more diversity at the conference this year than I remember from last year (and hopefully more going forward!). But that remains the primary demographic of the conference. Anyway, there are people who have earned their name as a famous member of the homebrew community. And going to the homebrew conference gives you a chance to meet and talk to some of the big stars. I got to meet, re-meet, and hang out with many of the people who inspired and educated me as a brewer over the years. It is great that the conference gives this opportunity in such a casual and communal setting. And every time I met one of these homebrew leaders they were always very welcoming and humble. When it came down to it they were a person who liked beer and liked talking about it with others who were interested. I’m sure it could be exhausting seeing a bunch of people who want to talk to you that you don’t know, and maybe the big names don’t get as much time for their friends as they’d like, but every one of them that I met over the weekend seemed genuinely happy to talk to those who were approaching them. I’m sure there could be exceptions to this, but I didn’t witness it in the course of the conference. Closing thoughts: I wanted to give a quick congratulations to Amos from Browne & Bitter, whom I mention somewhat regularly on here, for his gold medal in Sour Ales. Read about his soleras the process for the winning beer here (and in the subsequent linked posts from that one). Also wanted to give a quick shout out to two clubs that I spent a good bit of time with at the conference: the DC Homebrewers Club and TRASH (Three Rivers Alliance of Serious Homebrewers). Both had great members and great beers at club night (I mostly spent my time at one of these two booths). So thanks to those clubs and I look forward to the next time I get to try some of your beers! Ok, that’s it for the wrap-up of the conference. Not as quick as I had in mind when I set out, but I suppose brevity isn’t one of my strengths. As a continued follow up to NHC of sorts, I’ll spend the next few weeks working on getting aspects of my presentation up on the blog. Also look out for a quick interview I did with Basic Brewing Radio, which may be showing up among other club night interviews in July. Thanks also to Franklin, another good friend met at the conference, for taking a photo of the interview. As you can see, when I'm talking and really thinking about something I tend to use my hands a lot and stare off blankly to the side. Looking over Baltimore's inner harbor toward downtown. Hey Dave, it was great to meet you and get a chance to try some of your delicious aged beers. Thanks again for the great talk, it will definitely influence how I think about grisettes and design my recipes in the future. Thanks! Great to meet you as well. Glad you got some good stuff out of the talk! It was great to meet you Dave! Thanks for the shout out! Looking forward to opening that bottle you gave me! Great to meet you as well! I can't remember if I gave you a little tag of details on that bottle. Did I? Dude, great to meet you. Awesome site. I need to read more of what you write. Thanks Brian! Great to meet you as well. And I like the work you're doing on your site too. Mine has been fairly heavy on historical records and travel as I haven't been able to brew for most of the past year, but hopefully it shifts back toward actual brewing shortly.